For Mother's Day, my sister gave my mother an entire basket filled with foods from the Tastefully Simple gourmet foods company. 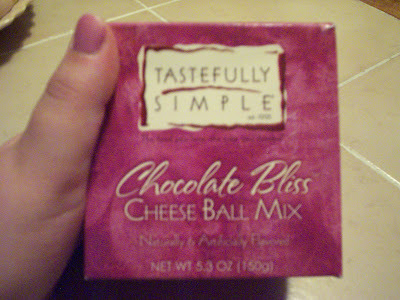 Mom received various dips, bread mixes, and something called a Chocolate Bliss cheese ball mix. We were dying to have an occasion on which to have a chocolate cheese ball, and it seemed that our preliminary Fourth of July home party was the perfect thing. 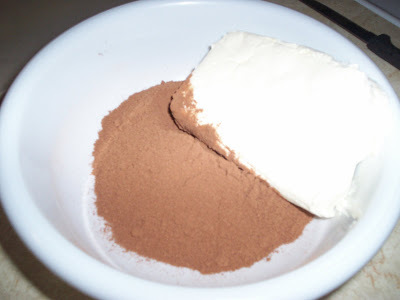 Now the recipe instructed us to blend the chocolate mix with an eight ounce block of cream cheese, chill for two hours, and shape into a ball. Then, serve with pretzels or pound cake. Sounds good, right? Well, knowing my family, we weren't happy with just pretzels and pound cake. We wanted to turn this cheese ball into a mousse/cheesecake - mini mousse/cheesecakes to be exact. With just a few simple ingredients (and the handy recipe on the side of the box), we made a most excellent holiday treat. 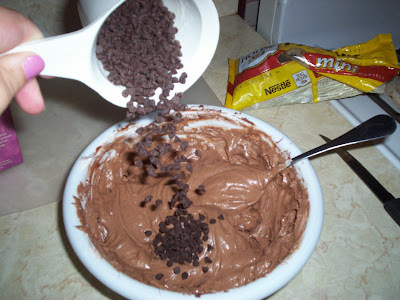 STEP ONE: Blend eight ounces of softened cream cheese with the Chocolate Bliss cheese ball mix. 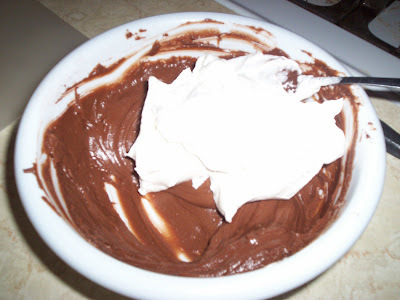 STEP TWO: Fold in eight ounces of thawed non-dairy whipped topping (a.k.a. Cool Whip). STEP THREE: Fold in a half cup of mini chocolate chips. 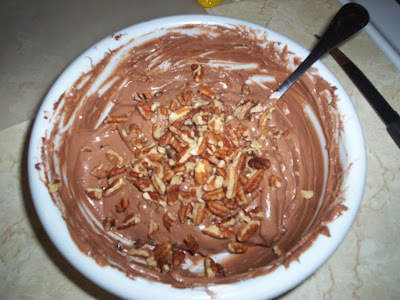 STEP FOUR: Fold in about a half cup of chopped pecans. 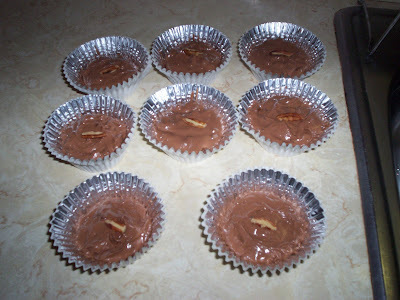 STEP FIVE: Spoon mixture into baking cups. For added beauty, throw a large pecan on top of each cup. Chill for four hours and enjoy! THE VERDICT: Excellent! It was more like a chocolate cheesecake-flavored mousse than a plain cheesecake because it didn't have any sort of bottom. However, it was chock full of delicious chips and nuts that made each bite extra tasty. The flavor was rich and sweet, and a little half cup serving goes a long way. Mom and I - and even Dad - thought it was delicious. We would definitely recommend this simple treat and look forward to trying the rest of the goods from Tastefully Simple.